JEYNES JOURNEYS: Come to us! Our plans to expand JoJo into the US of A started just over two years ago when I very first started discussions with Laura about me joining the team. I think one of the first things we ever shared was the desire and excitement to sell in America – a country that theoretically should like us and from sales already coming through on the ecommerce side, there was certainly a market on the East Coast but how far could we take it..? After more than ten trade shows in New York, Atlanta, Kentucky and LA in less than 18 months, we have already built up an amazing following from huge well-known retailers to small classy boutiques – all in love with our clean, nautical, European styling. My role is not just about increasing trade in the US and as time passes by, there are and always will be, many more markets that love JoJo. We are now selling in over 60 countries and whilst our strategic emphasis has been on all things Stateside, it has by no means meant we’ve forgotten about the rest of the world! In the last few weeks alone we’ve gained new accounts in Suriname, Thailand, the Bahamas, the Philippines and Brazil! We will continue to attend the key trade shows in America but it’s not fair to insist customers wait for those dates and many cannot always get to see us. So we have entered a new and exciting era…for anybody who has read these blogs recently, you’ll know I’ve been on trips recently to specifically recruit Sales Reps across the country – my job is done! We not only have an amazing team covering USA but I’ve also added teams to sell in Canada. Unlike many companies, we’ve taken it a step further and this week we flew over all 16 Reps to London to spend 3 days with the entire team to live, learn and love JoJo. So this blog is not, for a change about me travelling anywhere but about everyone coming to us! Monday started with the arrival of an excitable and surprisingly fresh-faced bunch of faces. Over breakfast in our airy photo studio, introductions were made, itineraries shared and expectations of the next few days laid out – all mixed in with tales of what they’d been up to over the weekend : spectacular afternoon teas in the Lanesborough, disappointment at not seeing the Queen, open-top bus routes in chaos due to gas leaks and of course…the weather. We couldn’t have ever imagined London would be basking in 30+ temps and clear blue skies – you get the idea – they were all delighted to be here. The first day was pretty heavy going for them and my team. A full-on 6hrs of how a range is born, where we get inspiration from and then the entire Spring 2014 collection presented to them in chunks by my guys who have worked tirelessly to make sure everything was ready for their arrival. 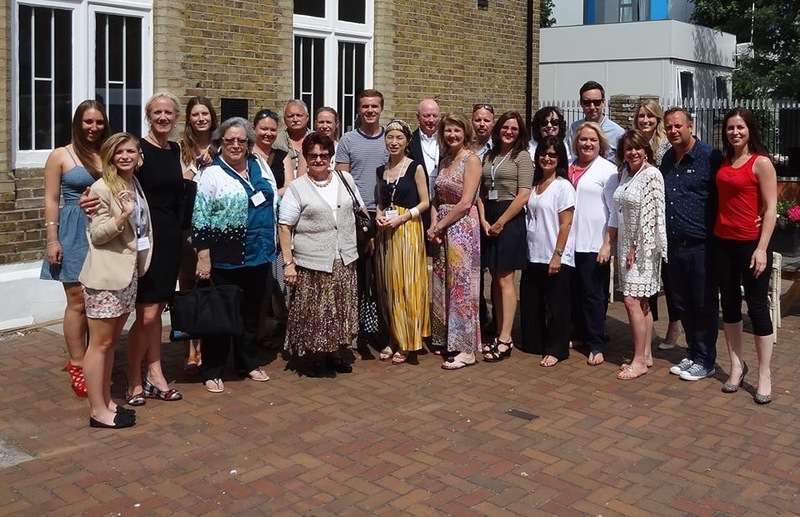 Having a different person present each category went down well – they loved getting to know the team better and there were enough oohs and aahs to last a lifetime – and after showing 800 kids and 400 maternity lines it felt like a lifetime. We had 800 kids' and 400 maternity lines to get through! But to the very end of the day they were all fired up and thrilled at what they’d seen which was exactly what we wanted. 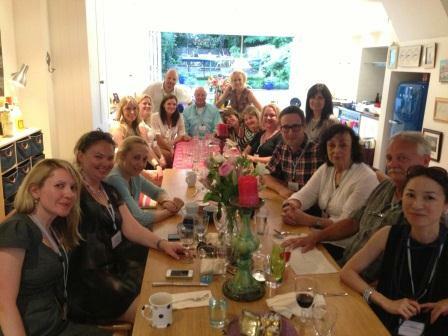 Peppered with the “Peter Jones Meets…” BBC documentary about Laura’s story and then home cooked supper at her house that evening, they all felt they gained a great insight into who Laura is, who we are and what Eton mess is! Day two started with our ever-growing JoJo non-clothing range being presented which really caught their attention – not only was maternity a new area for many of them to be selling but the thought of showing our non-clothing product as well meant they could truly see how being the Sales Rep for JoJo meant they could truly sell everything a nursery store might need – a true one stop shop. What then followed was more of a Mark Jeynes overload day where they had every nuance and small detail of working with JoJo explained in great detail. 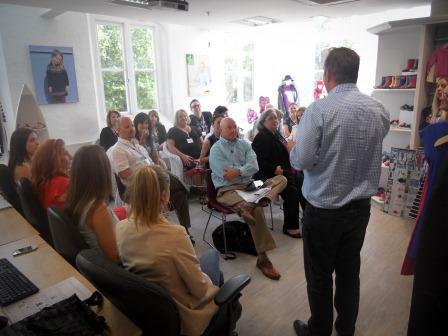 We also gave them an opportunity to acquaint themselves with the one person they need to be best friends with – the JoJo mannequins which are currently winging their way across the Atlantic along with samples, fixtures and other props to adorn their already gorgeous showrooms. I have to say, watching grown adults scratching their heads, trying to work out where each arm and leg go was ‘a moment’ – the guys in particular looked as if they’ve never held a lady in their life! 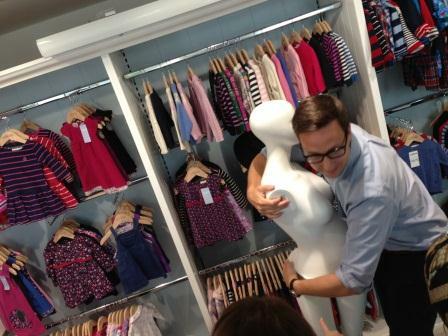 Getting to grips with a maternity mannequin! Then, spread across an 8 seater car driven by me and a 16 seater minibus driven by Laura (!) we took them on a tour of three London stores – a great opportunity to see one of our smallest, oldest and newest shops plus a chance to get a feel for the less well-known, non-touristy areas of our great city. They particularly loved Northcote Road (“so this is real London”) so much so that a chunk of them returned later that evening for supper and drinks. 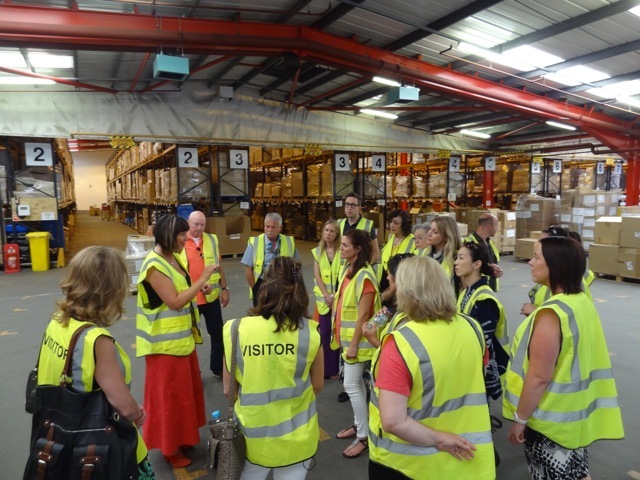 The final day was a long but rewarding one – this was about completing the full cycle of JoJo as a company: a day understanding the distribution process in our warehouse in Wales. In our convoy, we set off at 8:30am on the hottest day of the year so far with goodie-bags of breakfast and excitement. 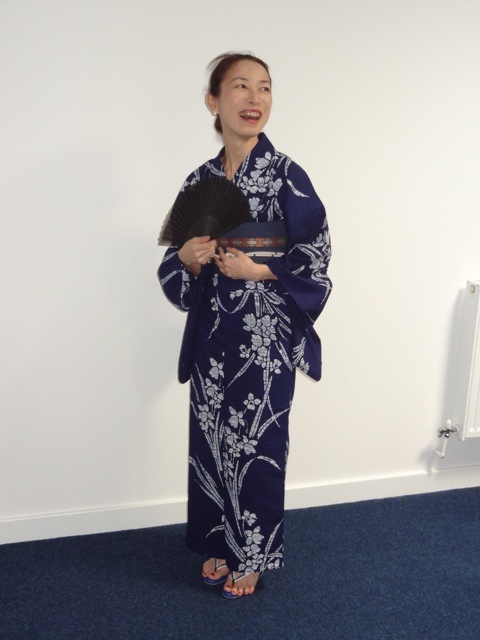 Of all days, despite the heat, Mayumi our lovely Distributor from Japan (who joined the 3 day event) decided to wow us with her traditional kimono – for a brief moment she became a photographed model as the entire group asked her to pose and twirl whilst marvelling at how incredible she looked. After a brief stop and tasting session of Cornish pasties, we finally arrived at Newport where a full tour in oh-so-glamorous high visibility vests was carried out. No matter how much effort the ladies had put into their third day of fabulous outfits, this was a moment they probably did not want photographed…oh well…what a shame! 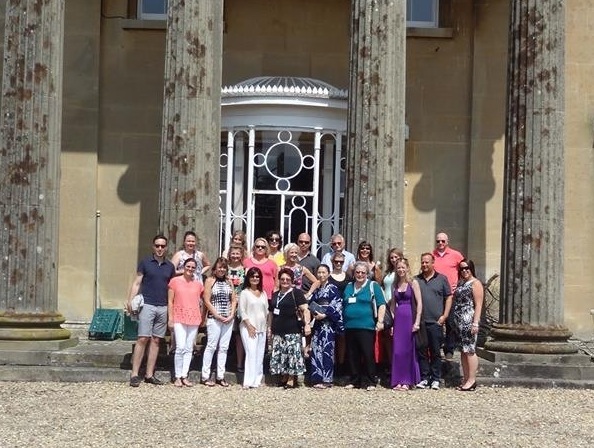 We then drove through the beautiful countryside to Clytha Park, Laura’s family home where a first class farewell lunch was laid on for everyone. A final opportunity to chat to the Welsh team, ask us all questions and ensure they were fully JoJo’d up. On the drive back to London with my car full of the lovely people from Montreal and Toronto, we reflected upon the 3 days and how great it had been – and it really had been great. A great laugh, a great education for all, a great opportunity and a great group of truly brilliant Reps who I feel confident will do an amazing job of spreading the brand across Northern America and Japan. It was a fabulous time! Nice recap mark!